Frazer-Nash is working with Marine Current Turbines to provide engineering and related technical services to help minimise fatigue loads on its next generation SeaGentidal turbine, and reduce the costs and risks associated with this renewable technology. 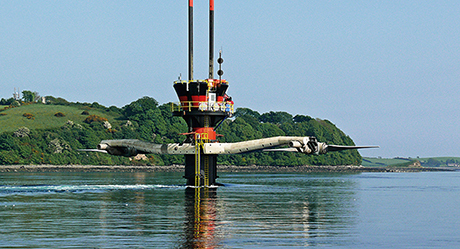 Marine Current Turbines appointed Frazer-Nash due to its experience in the sector, and the consultancy's previous work on the first generation SeaGen turbine, to advise on how to minimise the loading for the next generation turbine design. The SeaGen turbine consists of a horizontal cross-beam supporting a rotor and generator at each end. One of the key lessons learned from the first generation turbine concerned the hydrodynamic interaction between the crossbeam and rotor. When the tide flows in a particular direction the rotor is in the wake of the crossbeam which causes an impulsive load on the rotor blades and contributes to fatigue loading on the machine. Frazer-Nash built a series of models to understand the hydrodynamic interaction between the rotor blade and the crossbeam. These included a 3D Computation Fluid Dynamics model to capture the full physics of the interaction and accurate estimates of the resulting loads, and a simpler model which could be used to compare the fatigue loading from different crossbeam designs. Both models were validated against measurements from the first generation turbine. Paul Mather, Business Manager for Renewables at Frazer-Nash said: "We were able to use our modelling expertise to help Marine Current Turbines refine the crossbeam design to minimise the fatigue loads on the machine. This information will also inform the blade design, ultimately helping to minimise risks and reduce costs for the client."